Are you sick of trying to read your basal thermometer on those dark mornings? Well we have the answer for you. After years of searching for an accurate basal thermometer with great features of our popular Baby4You basal thermometer we have finally found the answer. - Blue backlight with large LCD monitor making it easy to read on those dark winter mornings or for early starts. - Digital time, date and alarm feature. Allows you to set an alarm to wake up in the morning and to view the time. - 60 temperature readings - the memories contain Temperature, Date and Time. - Repeatedly beeps 3 times when the test is completed. A basal temperature is the normal body temperature of a healthy person at rest. For optimum accuracy, your basal temperature should be taken at the same time every morning upon waking. Changes in basal temperature are related to changes in the female reproductive cycle. By taking your basal temperature daily and charting it, you can notice slight changes and patterns. Charting of your basal temperature, in addition to other information, can help you understand your menstrual cycle and ovulation. Temperatures typically rise (about 1.0ºF or 0.6ºC) within a day or so after ovulation, and are the result of heat-inducing hormone, progesterone. Recording and interpreting basal temperature changes are called the “Basal Temperature Method” (BTM). How to get the most accurate BBT? To Measure your BBT, first you need an accurate Basal Thermometer. After waking (and not getting up), put the basal thermometer under your tongue, close your mouth tightly and wait 2-3 minutes to get the temperature result. Why do you need to take BBT for such a long time? This Digital Basal Thermometer has a high accuracy temperature sensor which detects the temperature in the mouth in a step by step process. After it reads the peak value it will wait 10 seconds to confirm that it is the peak temperature before finishing the measurement and beeping. How to monitor your Ovulation Cycle? Recall the memories from the thermometer. 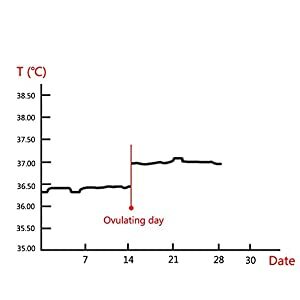 Mark it on the Ovulation Chart according to the memory which contains temperature and date.